The Pre-Raphaelities were a group of young painters, poets, and critics that came to prominence in England in the 1850s. Under the patronage of the renowned critic, John Ruskin, these artists captivated the art world of the time with their purposeful defiance of contemporary taste, and irreverent attitude towards the academy. The ‘Pre-Raphaelite Brotherhood’, as it was known, famously disparaged the Academy’s founding president, Sir Joshua Reynolds (1723–1792), as “Sir Sloshua” and had a reputation for rowdiness, recreational drug use, and improper relationships. The spirit of the brotherhood has lived on as much through their biography as their art, which has inspired a handful of television and film adaptations, most recently Desperate Romantics (2009), starring Poldark‘s Aiden Turner as Dante Gabriel Rossetti. Many pre-Raphaelite works are on permanent display at Tate Britain, Manchester Art Gallery, Birmingham Museaums & Art Gallery, and Oxford’s Ashmolean museum. 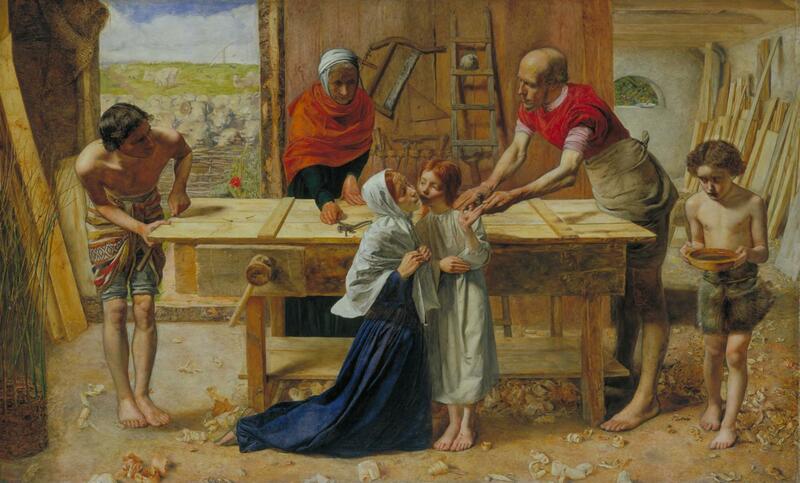 The brotherhood was founded in 1848-9 by William Holman Hunt, John Everett Millais, and Dante Gabriel Rossetti. The three founders were joined by William Michael Rossetti, James Collinson, Frederic George Stephens and Thomas Woolner to form the seven-member “brotherhood” who exhibited works under the initials P.R.B. 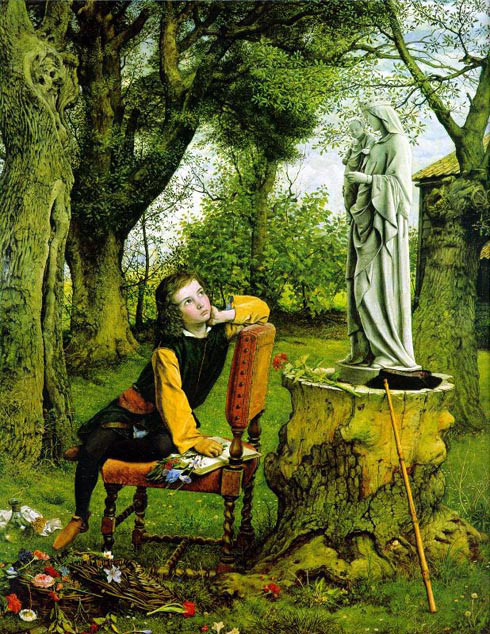 In addition to the formal members, other artists and writers formed part of a larger Pre-Raphaelite circle, including the painters Ford Madox Brown and Charles Collins, the poets Sir Algernon Charles Swinburne and Christina Rossetti, the artist and social critic John Ruskin, the painter-poet William Bell Scott, and the sculptor-poet John Lucas Tupper. Later additions to the Pre-Raphaelite circle include J. W. Inchnold, Edward Burne-Jones, and William Morris who would later found the Arts and Crafts movement. What were their Artistic Aims? The Pre- Raphaelites rejected the academy rules of form, composition and colour; pyramid structure of subjects, tone rather than colour, perfunctory rather than realistic use of light. All of this was thrown out of the window by these young artists. They sought to recover the medieval simplicity and purity that had been lost in the High Renaissance art they felt was typified by Raphael. Rossetti’s earlier works, in particular, show a pre-occupation with this period, but there are many other instances of medievalism and chivalric subjects in Pre- Raphaelite art. They aimed to bring truth back to art, refusing to idealise their subjects. They revelled in the minutia of nature, finding truth in the detail. Many of their paintings avoid pictorial focus; our eye is not automatically guided to the human figures, but is forced to wander over the microscopic detail; to see the bigger picture. They tackled modern subjects; prostitution, the city, and the working population. They experimented with new methods of painting (Hunt’s wet white technique) and were innovative in their use of the new, brighter pigments available from the 1840s. They drew inspiration from literary sources such as William Shakespeare and Sir Alfred Lord Tennyson, and had a close affinity with the written word. Dante Gabriel Rossetti was an accomplished poet as well as a painter, and many others in the circle attempted this cross over between the visual and the written arts. In the earlier works, there was a narrative or even a moral didacticism behind the paintings. It was art with a message. Later pre- Raphaelitism became more aesthetic, eventually influencing William Morris’s Arts and Crafts movement and the aesthetic/ decadence movements of the 1890s. 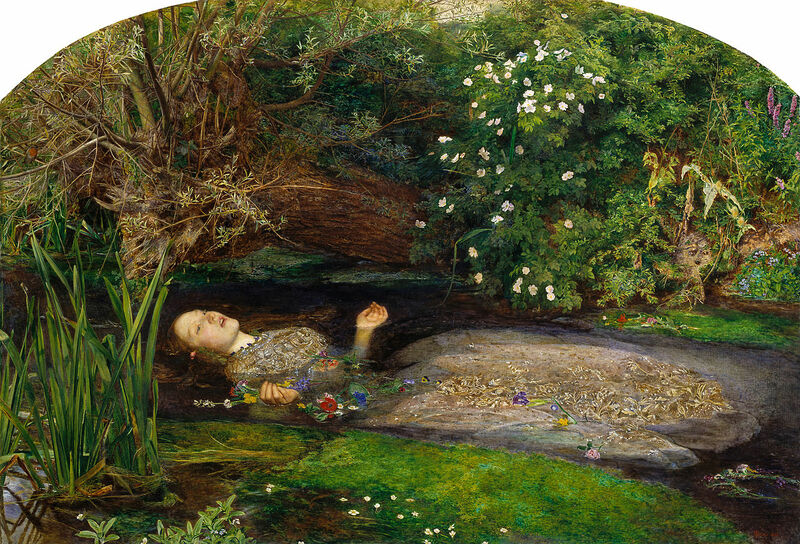 The Pre-Raphaelites refused to idealise their religious subjects. Instead, they attempted to achieve a realistic integrity that was condemned by some of their harshest critics as blasphemous. This realism is clearly visible in Christ in the House of his Parents. The setting is a realistic depiction of the workplace of a carpenter. The house is dusty and the floor is covered with wood shavings. The figures themselves have been painted “warts and all”; Saint Anne is an old, weather beaten woman with swollen hands and blotchy skin, Joseph’s trade is apparent in his dirty apron, rough hands and the prominent veins in his arms. Mary, heavily wrinkled, kneels on the dusty floor. And Christ himself is shown with dirty feet and hands, wearing simple clothing and showing no obvious signs of divinity in his appearance. 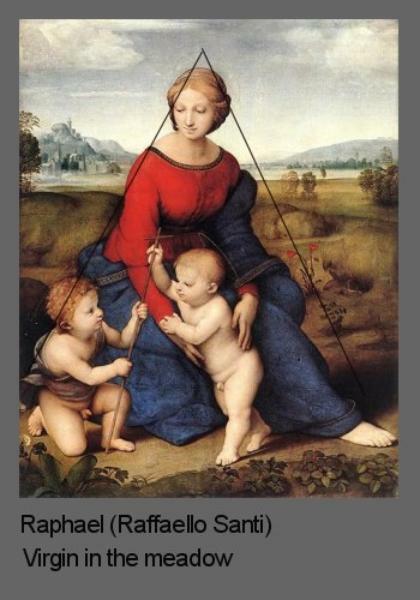 In this picture, you can also see how the Pre- Raphaelites were rebelling against the academy; Millais has completely ignored the pyramid structure they taught for use in group compositions, as seen here in Raphael’s Virgin in the Meadow (right). 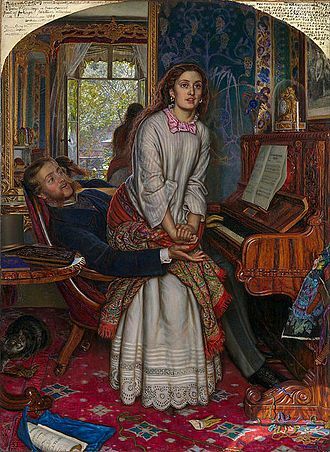 The Awakening Conscience introduces a theme that runs through many of the works of the Pre-Raphaelites: that of the ensnared woman or the woman brought low by circumstance. These paintings show the brotherhood’s feminist credentials in the centrality and agency given to the women they are representing. The women in pre-Raphaelite works are not passive art-objects, but thinking, feeling human beings. In this painting, the woman, a mistress or a prostitute, is waking up to her circumstances. The domestic scene to which she doesn’t belong is cast in shadow, and her expression and posture are both transitory–her body in the process of standing and her expression is coming out of a smile. The lascivious man out of whose lap she is rising is linked to the cat beneath the table, bored of playing with the discarded wool. The roll of music and the dropped glove show the carelessness of the man in whose clutches this girl has found herself. She looks towards the open window in the hope of escape. The concentration on finely wrought detail in this painting is typical of pre-Raphaelite works. Here it renders everything in the painting into the service of the woman’s sudden realisation. As John Ruskin noted at the time, ‘There is not a single object in all that room–common, modern, vulgar […] but it becomes tragical, if rightly read’ (Ruskin, 1995, p62). The woman takes centre stage in her own tragic moment, a moment captured in the depth of detail in everything around her. 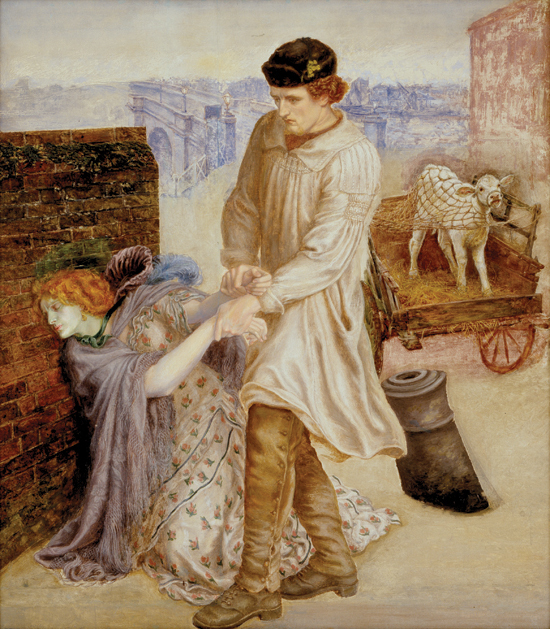 Similar in theme to Hunt’s The Awakening Conscience, Rossetti’s Found depicts a young country girl brought low by her life in the city. Discovered by an old acquaintance, a young farmer on his way to market, the woman pulls away in shame at her situation. The white calf trapped under the net speaks to her tragic situation. Rossetti worked on this painting for nearly twenty years without ever completing it. 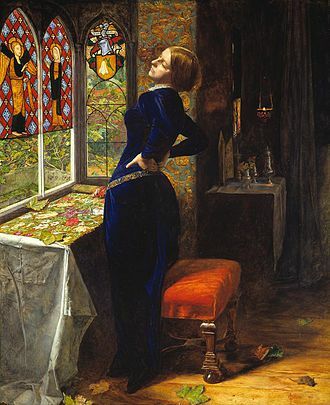 Based on Sir Alfred Lord Tennyson’s poem of the same name, this is one of the many examples of literary influence in Pre-Raphaelite art; an earlier picture of this subject also by Hunt appeared in the moxon Tennyson, a famous edition of Tennyson’s poems illustrated by the brotherhood. 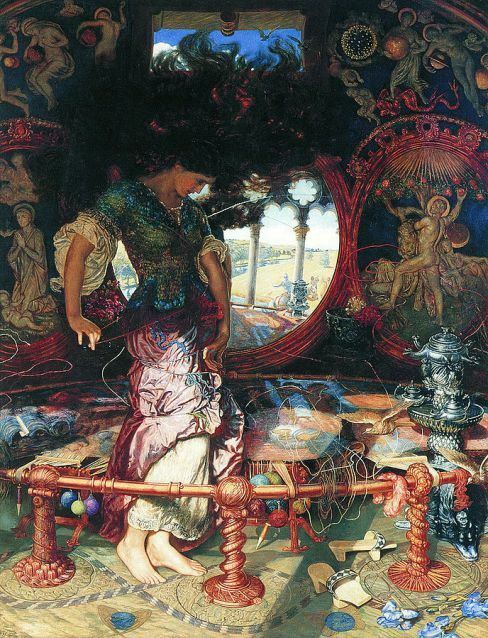 This painting captures the fatal moment when the Lady of Shalott sees the knight in the mirror, thereafter becoming part of the tradition of fallen women. As with most of Hunt’s work, this picture would happily fit into a religious context as a discourse on good and evil. The central frieze in the background is a depiction of Heracles (Hercules) in the garden of the Hesperides. According to fable, the nymphs neglected their duty to protect the golden apples and ate them themselves; they were eventually forced to leave the garden. Heracles is painted with a halo, a Christ-like figure shown overcoming the serpent. The warning enacted in this frieze and the figure of the virgin Mary looking imploringly into the picture from the right show Hunt’s reading of Tennyson’s poem as one of the evils of temptation. For the purposes of realism, the model’s hair was draped over an easel to achieve the windblown effect that could be interpreted as a literal representation of a falling woman. This painting was inspired by another of Tennyson’s poems, ‘Mariana,’ which in turn drew from Shakespeare’s Measure for Measure. Mariana’s dowry has been lost at sea, and she faces losing her potential husband as a result. The painting centres around Mariana’s weary pose. She is tired, and as implied by the fallen leaves, she is facing the autumn of her youth and beauty. Although Dyce wasn’t a central member of the brotherhood, this painting in particular sympathises with their principles. The detail in the representation of nature is almost photographic, and certainly the most intricately rendered feature of the painting. The figure of Titian by contrast could be described, to use Ruskin’s term, as ‘Raphaelitesque’. The use of subdued tones and the traditional, averaged proportions are made all the more noticeable by the varied and vibrant background in which he is set. Titian was an artist at the time of the High Renaissance, a contemporary of Raphael, though not as slighted by Ruskin who categorised him as a colourist, placing him alongside Turner as one whose pictures are ‘like the rose,- glowing with colour in the shadows, and rising into paler and more delicate hues, or masses of whiteness in the lights’ (Ruskin, 1995, p84). In this picture, Titian is shown to be ignoring the colours around him to focus on the mass of grey that is the statue. This painting is therefore a quite unsubtle comment about what is artistically important; colour and nature. This vibrant, sexual image was produced using a technique Hunt developed called the wet white technique, which involved painting onto an undercoat of bright white before allowing it to completely dry. This allowed the undercoat to shine back through the film of colour, producing the vibrant, pure tones of the image. Again, as with much pre-Raphaelite painting, nature and detail in nature come to take centre stage. 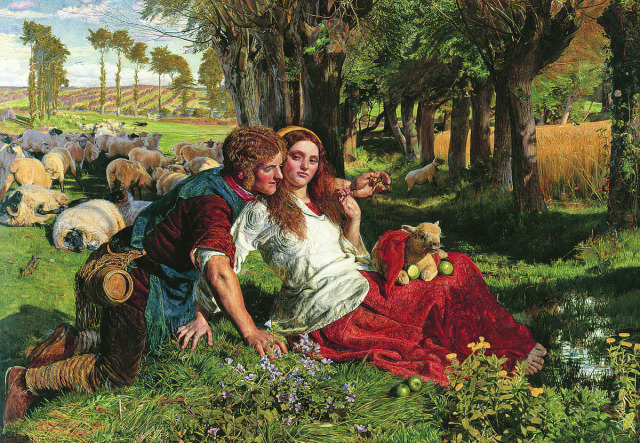 There is a great amount of detailed attention given to the long grass, the flowers, and the reflections in the stream in the foreground, amongst which the bright reds and blues of the shepherd and his shepherdess sit perfectly. The figures each grab at the ground, the shepherd reaching his other hand out towards the almost luminescent apples cradled by the lamb, projecting their physical desire for each other into their surroundings as they lean closer together. Enjoyed this post? Support my writing, leave a tip!